COULD the 'unthinkable' be about to happen to Indian cricket? In the aftermath of England's triumph in the third Test there have been calls for the biggest icon in the game, India's batting legend Sachin Tendulkar, to call it a day. The selectors have already announced their squad for the fourth and final Test against England this week and, although Zaheer Khan, Yuvraj Singh and Harbhajan Singh have been culled, 39-year-old Tendulkar kept his spot. But after a miserable 2012 the calls for the Little Master to call it quits are starting to gather force. So far this year in 14 Test innings the batsman has just two half centuries to his name and a top score of 80. His last Test hundred came two years ago in January 2011. Now his former captain and team mate of 12 years, Sourav Ganguly has, according to The Daily Telegraph, "uttered the unthinkable" and called for Tendulkar to quit. Talking to the Times of India, which also omitted Tendulkar from its Indian side for the final Test, he said: "Sachin desperately needs to get runs. He has achieved a lot. He is getting a long rope because of what he has achieved... As somebody watching it from outside Tendulkar [is] not performing, I think if I was Tendulkar I would go. But it's up to him at the present moment." There have been similar sentiments from other influential figures in Indian cricket. Former selector and Test player Mohinder Amarnath also told the Times of India it was time for Tendulkar to bow out. "Sachin is a great cricketer. He has been playing for many years. Now he cannot play the way he was playing earlier. The time comes for everybody," he said. Another former selector and Test great, Dilip Vengsarkar, echoed Amarnath's thoughts on Tendulkar. "Sachin is a fantastic cricketer. He has contributed a lot for Indian cricket. However, he is now 39 years old. He will continue scoring runs, but not with the same speed. He will not dominate as he used to in the past," he told the paper. At the weekend Telegraph columnist and former England skipper Michael Vaughan was frank in his assessment of the Indian batsman. 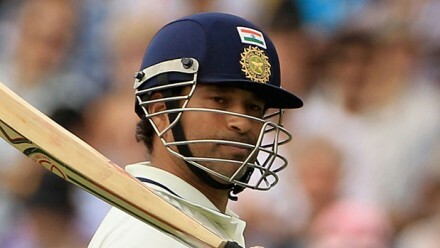 "It is time for Tendulkar, great player that he is, to walk away now for the sake of the Indian team," he said. Another Telegraph cricket columnist, Simon Hughes, concurred.